Tagged under Sakurako Gokurakuin, Broccoli, Aquarian Age, Series. Mana Kirihara returns to her home town after having been gone for seven years and reunites with her childhood friend, Kaname. But Kaname seems to have changed while they've been apart. Mana's re-emergence soon sets off a series of events that alters the lives of Kaname and his best friend, Naoya. Classmates Isshin and Tsukasa, as well as their teacher Tomonori, find themselves drawn in as well. Soon, they all discover that they have a part to play in the "Aquarian Age"-- a war that has been secretly raging for thousands of years. Now the future of the world depends on one girl and her destiny. This series is very cliched and predictable. Juvenile Orion features the standard, klutzy female protagonist with a heart of gold, and a strong desire to protect those around her. While certain anime knows how to take that character archtype and make it endearing, this series foregoes it completely. And no, no, I'm not talking about Fruit's Basket's Tohru Honda (that would be an improvement!) - no, I'm talking about Mana Kirihara, the cliches of all cliches in terms of female protagonists. She has a rare, powerful ability which causes her to be the main target of a darker force - pffft, fanfiction, please. 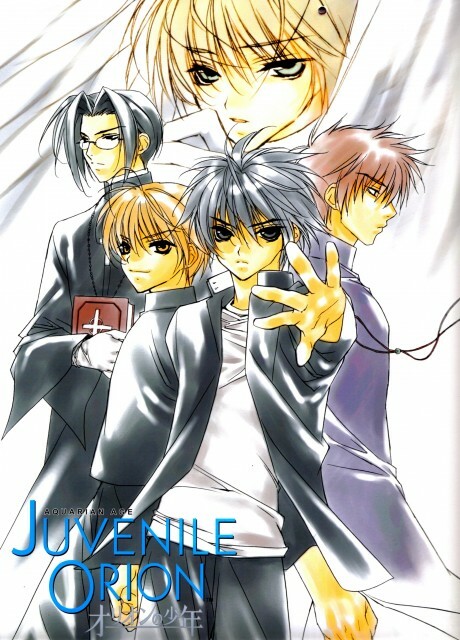 As for the other characters, they are as underdeveloped and gorgeous as you'd expect: there's the silent, brooding male character (but of course, Mana's lovable nature penetrates his cold exterior - in about a millisecond), there's the soft spoken character (who's also lost his memory - gasp, what a twist! ), the innocently naive character, who's always being mistaken as a pervert and finding himself in oddly perverted situations. You get where I going with this? Yeah, it's a trip down Cliche Lane again. While the artwork does slightly lift up this series from a harsh 2 or 3, it's not a miracle either. The character designs lack originality and are instantly forgettable, and it lacks true finesse which would've truly given this series something to stand on. But alas, this series just comes off as a mess bowl of cliches and crappy characters. You're better off skipping this title of picking up something else.